As job openings go, this is a pretty special one. Do you think that you might be just the person to combine a breath of mystery with a whisper of history? To balance scientific rigour with managerial vigour? Stonehenge is looking for a general manager. This could without doubt be an ideal position for someone fascinated both by the history of the stones and the archaeological context of the iconic site, while giving them a key role in the modern uses of Stonehenge. Striking that balance between preservation and retaining it as a living breathing part of English cultural life. The position will pay the healthy salary of £65,000 a year. The person who makes it though the selection process and lands the post will be responsible for maintaining the ‘dignity of the stones’ and meeting with Druid leaders and other members of the public that visit the site each year. Having a fine line in jossticks and crystals however will be nowhere near enough to land the job. 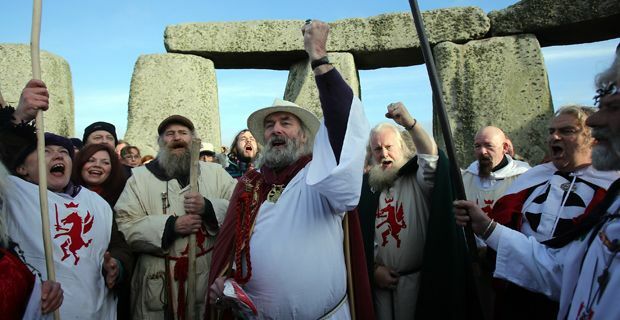 Stonehenge bosses are only seeking the ‘brightest and best’ for the job, which also requires you to ensure the solstice celebrations ‘aren’t in some way compromising the mystery and integrity of the stones’. Whatever that means. You would think that solstice celebrations do a lot more for the mystery of the stones than coachloads of tourists photographing their way round the visitors centre. Tim Reeve, English Heritage’s historic properties director, said: ‘You could be up at the stones one minute, in outdoor garb trying to help visitors, then you can be back in a state-of-the-art visitors’ centre.